Banjers' lines are those of a true motorsailer, so they have a hull-propulsion system combination that performs efficiently under power alone. Bred from North Sea trawlers, Banjers were, in my opinion, conceived basically as seagoing motor boats, with a big propeller and auxiliary sails. Also, the relatively small draught was very convenient for their use in The Netherlands and central Europe's sailing grounds, plenty with navigable canals and shoal drafts. Hence the abating masts. At a seaway, the natural tendency to roll of such a design was evident: Sails were needed to dampen down motion at most points of wind and seas conditions. On the other hand, such sails, cleverly used in conjuction with engine, make faster passages, provide more stable motion and allow for a relevant fuel economy. 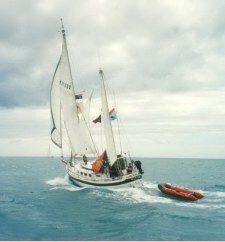 The good performing under motor and sail to windward, in conjunction with the big, of good visibility and well protected pilothouse, gives a fast and pretty nice headwind motorsailing, in conditions sailing boats with exposed cockpits obligue their crew to wear their oilies and suffer a constant and unpleasant spray. In a Banjer you can sit at the helman's position enjoying a glass of wine in your good old shirt, while comfortably and efficiently beating to windward in a full force 6 over a choppy sea, with the right combination of sail and engine power. So here we have a real Motorsailer philosophy, in line with other North and Central Europe designs, such as Nauticats, Fishers, Roggers, LM's, etc. The long keel helps to keep a steady sailing while going to windward. You can even let the boat to handle by herself unattended for several minutes, if properly balanced. On the other hand this long but shoal keel makes the boat to drift significantly to leeward if you beat her hard to windward under sails alone. 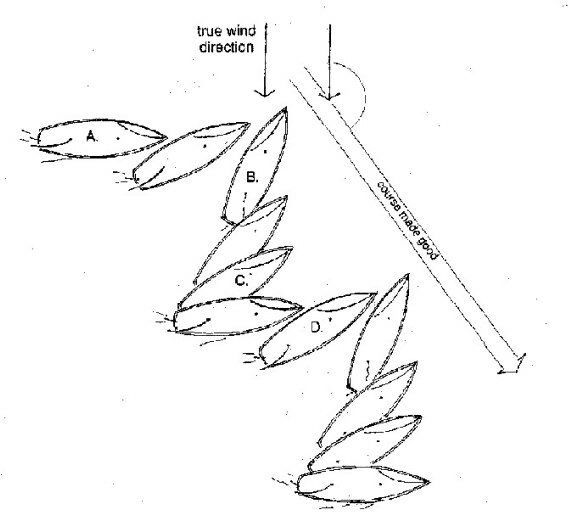 Although your sailing angle to the apparent wind may be around 40º, the real thing could even be 70º or more. An extra reason to motorsail in that condition. (You can find more information about Motorsailing at a devoted site: "MOTORSAILERS & MOTORSAILING". Pay a visit, I think it worths while). Sailing with wind and sea on your back, though, will demand for your tillering skills to handle the waves properly. Although some authors do not recommend it for standard motorsailing, with Banjers you may find that under some conditions, with short following seas and little wind, a point of motoring may help you to keep a more effective helming and comfortablier movement. 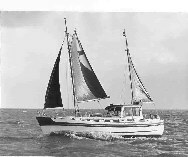 With her ketch rig and a bowsprit, Banjers allow for the proper combination of sails for every sea and wind condition. Reaching and quarter running in a breeze with full cloths is what they like the most, being able to attain respectable speeds in spite of their heavy displacement. Some Banjers even display also a mizzen satysail, that gives extra power when the wind is more gentle. On a deadrun, or almost deadrun, the big wheelhouse and the mizzen tend to blank the forward sails, so is mandatory to lower the mizzen when the wind is further aft than 150º. Poling out the genoa in that condition will significantly help to stabilize course and motion, allowing for a nice sailing even with the wind on the "wrong" side. When sailing in a near gale or even in a not too strong gale in shelterd waters, you may slowly and safely motorsail through it, with a small jib and mizzen or mizzen alone. In a gale you can run before it, just with a working or storm jib, or heave-to (See "Heaving to in a Banjer"). 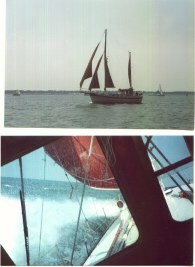 (Graphics and excerpts from Andy Chase's book, "Auxiliary Sail Vessel Operations". Reproduced with Cpt. Chase's permission). The goal in heaving-to is to bring your boat to a near stop while comfortabily riding the waves, and should be used more frequently than it does. There are various reasons for doing so, such as having lunch or a swim on a nice day, or reducing the strains on the vessel, crew and rig in a gale. The aim is to achieve a balance of opposing forces that will hold the vessel as nearly in one place as possible. Under some conditions it is probably unwise and unsafe to heave to. With very big seas constantly breaking all around you, pounding on deck and hull, you may be safer running before the storm at a slow and controlled rate, possibly under bare poles with warps streamed astern. However, in most storm conditions, heaving to will be the first option that presents itself when you feel you have had enough punishment and want to rest. To heave-to under reduced sails, Banjers will require them forward and aft counteracting one another. Most of the times this will be mizzen sail and jib (or staysail if wind condition allows for). The mizzen sail has to be sheeted to leeward, and the jib has to be sheeted to windward. The rudder will be secured to windward at an angle you must find for your combination and size of sails, and will cause the Banjer's head to come up into the wind when she gains headway. The effect of this combination is illustrated in figure below. It's wise you practice previously in good or not so bad weather, to learn how your boat performs and feel confident about the technique. "In Figure A, boat is broadside to the wind. The pressure on the mizzen is trying to drive the vessel up into the wind, and the pressure on the jib is trying to drive the vessel off the wind. If the mizzen takes charge, it will drive the boat's head into the wind (with or without the assistance of the rudder) until it starts to luff. 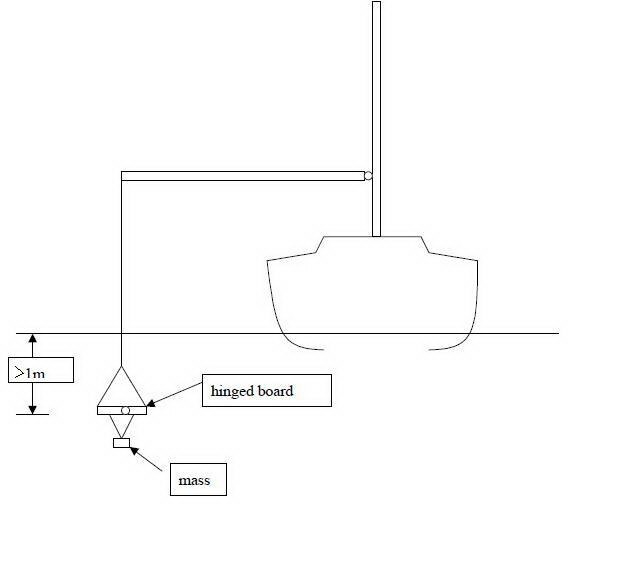 Figure B shows that the jib is aback and the mizzen is luffing and no longer exerting any driving force. The jib will take over, forcing the bow to fall off. 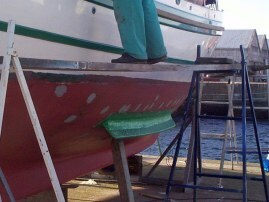 Since the boat's headway died off as soon as the driving power of the mizzen was lost, the rudder no longer has any effect and so allows the vessel to fall off. Figure C shows that since the jib is aback, it will not develop any forward thrust. Rather, it will be pushing the boat backwards, acting as a brake. Finally, in Figure D, as the mizzen fills again and develops forward thrust, the process is repeated. The boat gains headway and heads up, the mizzen luffs, the jib pushes the bow back, and she falls off again. The effects of this process are quite noticeable. The boat will pull ahead, round up, luff, stall, fall off, and start over. In the process she will also sideslip, more or less, depending on her underbody shape and the amount of windage aloft. Since there is some headway involved in the process, the boat will make good a course that is somewhat forward of dead downwind. One of the major advantages of the ketch rig is the ability to balance your sail plan under so many different combinations. If you want to ride a little farther off the wind, that is, with the bow pointing more downwind, you might try striking the mizzen and setting a trysail on the mainmast (or a reefed main) and a backed staysail (or jib). 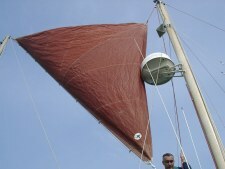 This combination shifts most of the sail area forward of the center of effort, thereby causing the bow to fall well off. You then rely on the rudder to bring her up into the wind. This will mean you will also maintain more headway than leeway, which could, under some circumstances, be desirable. Once you get set up for a certain sail combination, watch and see how the boat rides. If she wants to tack, your center of effort is too far aft. 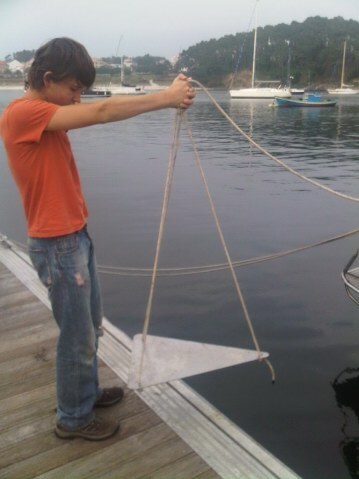 Your first and simplest correction should be to slack the sheet of the aft sail. This will allow her to fall off the wind farther, and that sail will luff sooner as she starts to head up, killing the headway that was driving her across the eye of the wind. If this is not sufficient you will have to set more sail forward (sheeted aback), or shorten sail aft by reefing or changing to a trysail. The boat will settle down slowly. You must give her time to establish her pattem. It will probably surprise you how comfortable and steady she will be. If it is blowing a gale, the relief on you, the crew, and the vessel is extraordinary. Once the pattem is established, you should try to estimate your set and drift. You must maintain your position fixing just as carefully as if you were under way, because you are under way. You will be making a knot or two (possibly more), and the direction of your drift will be somewhat forward of dead to leeward. If you are in a gale, and it blows for a day or two, your vessel can cover a substantial distance. Watch the weather and the set of the currents in the area. Your direction and rate of drift will depend on these. If you should need to cut down on your drift to leeward, running the engine ahead will direct the drift farther forward, which may suffice. There are many reasons to heave-to, besides heavy weather. It is unfortunate that more sailors do not appreciate the usefulness of this technique for circumstances such as waiting for a berth, the tide, or daylight; for a swim call; or for a smoother lunch on a rough day. If something needs your attention below and you are not comfortable leaving the sailing to the guests, heave-to. Think of it as putting on a parking brake, but one that does not hold you completely stationary"
Answering a question from our fellowmember Claire, in my opinion Banjers are not designed to be self-righting boats, because of the big wheelhouse with those big weak windows, that normally would inmediately break in a capsize, flooding the entire space with seawater. From there water would enter through the companionway (not watertight at all! ) into the main saloon. And because of the panels in the floor of the wheelhouse would drop away (Unless secured), also the engine compartment may be flooded (not to talk about the destroying effects of the big and heavy floor panels flying through the pilothouse!) . Not a nice picture, indeed. Well, this doesn't mean, absolutely, that a specific Banjer may not self-rigth herself in a specific 180 degrees capsize. 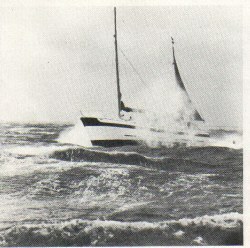 Although probably the inverted Banjer with a flooded wheelhouse may have a tendency to stay like that, the 4 tons keel ballast would be "up" there and you'd have the possibility that a next wave or even inertia may right the boat (If it takes not a long time and there is no a big amount of water inside). 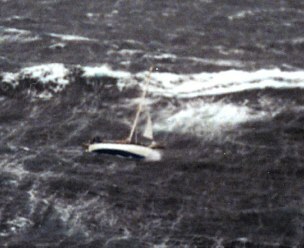 Other boats have survived situations like this before, having also being more or less flooded through the capsizing process. If the big whelhouse coud be effectively watertightened, at least to a point not to allow big amounts of water coming suddenly into it, that could dramatically improve the Banjer's self-righting capabilities, because of the big levering arm between the center of buoyancy of the submersed body in that condition, and the center of gravity of the boat, which would dramatically increase the righting moment. Being like that, Banjers would be really self-righting boats. But the bad news is that the wheelhouse is not structurally reinforced to handle static water pressure, not to talk about the dynamic forces involved in a capsize. The wheelhouse itself would probably be broken in the process. So, again in my opinion, Banjers are not designed for long ocean passages but for coastal and inland cruising. For sure you may sail the world around without never suffering problems (We all know the outstanding ocean sailings of Duck Soup and several Atlantic crosses of other members), but I think that is not what they are supposed to do the best. Banjers can be prepared to handle a capsize, absolutely, but that would involve a big amount of work to be done (And money to invest!). For a long trip away from home, what I should do is to make some basic securing and reinforcing work, as well as attach those perspex covers above mentioned in this page and fix the wheelhouse floors, just to guarantee things don't go totally wrong when the first problems arrive. Then I'd plan my passages in relatively short legs, always waiting for more or less good weather windows. Learn everything about this most important matter for Banjer owners, visiting this excellent page. 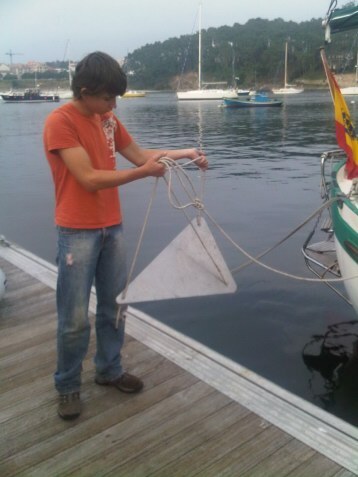 * Sails: Depending on sail area and wind strength, roll reduction can be considerable. We might assume a roll reduction on the order of 40% to 70% depending on sea state, etc., (Compared with a no-poles-no-sails Banjer). Inertial damping even at anchor due to the weight of the rig. Can contribute significantly to propulsive efficiency, at times completely eliminating the need for the engine. Excellent synergy when motor sailing. Possible as a retro-fit. Pretty expensive. Somewhat complex. Fun! 1) Change your short masts to bigger ones - Transoceanique style - if you are not in a limited height area. Expensive but effective. Should be the first choice. 2) If you have a short budget, you may try a mainmast backstay sail (like the one shown down here on MARIE), using an old yankee and leading the sheet to the top of the Mizzen mast (Some sail and block height adjustement needed). Dampens motion in a pretty effective way, as well as providing extra pull. Easy and inexpensive. * Active Fin Stabilizers: If sized correctly, Naiad claims up to a 90% roll reduction for active stabies, depending on vessel speed. Most effective at maximum vessel speed, less so at lesser speeds, minimally effective with no forward speed. Some efficiency loss due to frictional resistance, generally considered to be compensated for by lesser overall resistance of the more stable vessel. Possible as a retro-fit. Relatively expensive. Relatively complex. * Fixed "Twin" Keels: Depending on the twin keel geometry, per published data, roll reductions can be on the order of 40% to 65%. Deeper keels having greater area provide greater attenuation. Low aspect ratio considered a benefit due to being able to tolerate larger angles of attack (while rolling) without stalling. Location and geometry quite important for optimum vessel handling and resistance, as noted above. Vessel speed not important to roll damping. Added frictional resistance due to increased wetted surface area. Enhanced directional stability, if proportioned correctly. Unlikely as a retro-fit. Relatively inexpensive. Relatively simple. * Fixed "Bilge" Keels: Long, low aspect ratio bilge keels offer possible roll reduction on the order of 35% to 55%. Vessel speed not important to roll damping. Added frictional resistance due to increased wetted surface area. Enhanced directional stability, if proportioned correctly. Very common as a retro-fit. Pretty inexpensive. Quite simple. Adopted solution for MARIE. They are cheap, easy to do and work nicely, although dampening seems to be more in the range of the 25%, and waves bump under them when sailing heeled. * Lifting Keel : Under the Salon table. 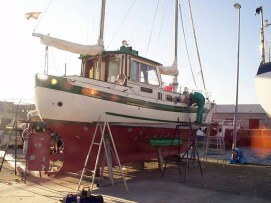 Complex and delicate works, needing an skilled boatyard/craftmen. Should greatly improve the quality of motion as well as winward abbility, reducing drift significantly. Unlikely as a retro-fit. Obstrusive. Expensive. 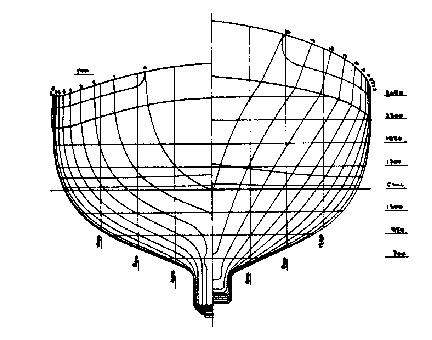 * Deepest main keel: Done by W. Sammerl in NYMPHE III. Very good solution also, although we find it difficult and expensive. Increased draught to 1.6 m. (We haven't got information about this solution, because NYMPHE III has been sold and we do not know her actual owner). And even you can also make your own stoppers using simple materials, as a metallic bucket with a hole in the bottom, hanged from a pole (or two poles, one on each side), or the like. I have two of those and hang them on opposite genoa poles at the sides, deepening them a couple of meters under surface. If rolling is not severe, I hang them from the cleats at mid length of the Banjer, thus saving the manoeuvering with the poles.